Corpus Christi, the sparking city by the bay, is a major deep-water port along the Texas Gulf Coast, the gateway to North Padre Island and a tourist destination. The city is home to the USS Lexington Museum, as well as Whataburger, a Texas hamburger chain. Ocean Boulevard was created in the 1930s, in a project that created the Corpus Christi Seawall and the T-head docks of Corpus Christi Marina for pleasure boats. More recently, Corpus Christi became known for Selena, the Tejano music star who was tragically killed in 1995. Interstate 37 begins at Waco Street before heading west through the city. West from US 181, the freeway heads meets SH 286 and SH 358 in quick succession. Paralleling the course of the Nueces River, IH 37 bends northwestward to meet IH 69 & U.S. 77 in Calallen before turning northward toward San Antonio. IH 37 is six lanes wide through Corpus Christi, with increased traffic volume as development moves west of the city and out toward small towns such as Orange Grove. The first section of IH 37, the interchange with US 181, opened in November 1959. The Harbor Bridge Project, replacement of the existing U.S. 181 Harbor Bridge, includes reconstructing portions of both IH 37 and the Crosstown Expressway (SH 286). Work along IH 37 replaces the freeway extending east from SH 286 with an at-grade boulevard, as the new alignment for US 181 ties into a rebuilt interchange with SH 286. Ground breaking for the $802.9 million project took place on August 8, 2016, with construction effecting IH 37 forecast for completion by spring 2020. U.S. 77 south from IH 37 at Calallen to Robstown was designated as a new segment of IH 69 in December 2011. 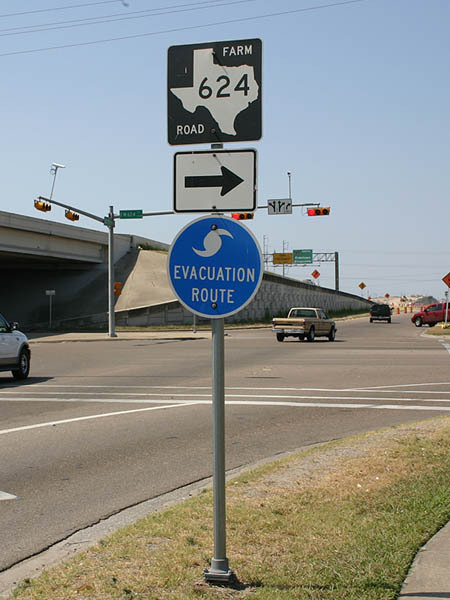 This changed on October 21, 2013 with the AASHTO approval to renumber the short section as IH 69E. IH 69E was extended 1.6 miles south to FM 892 from SH 44 at Robstown in November 2014. Overall IH 69 is slated to run south from Corpus Christi to Brownsville in the Rio Grande Valley, and north to combine with IH 69W as mainline IH 69 near Victoria. US 77 enters the Corpus Christi area co-signed with IH 37. Branching off in Calallen, the road continues south to Robstown, then Kingsville and Brownsville. The interchange with IH 37 was reconstructed from 1988 to 1991, with upgrade to full freeway status between FM 624 and Robstown completed in 2005. US 77 is part of the future IH 69 corridor, with portions at Robstown and the Rio Grande Valley signed as IH 69E. US 181 begins where IH 37 ends, at Waco Street Downtown, then heads north across the Corpus Christi ship channel (on what is locally known as “High Bridge”) . Following a narrow strip of land between Nueces Bay and Corpus Christin Bay, U.S. 181 travels northeast to Portland and Gregory before shifting northwest en route to Sinton and ultimately San Antonio. High Bridge opened in November 1959. The Harbor Bridge Project replaces the aging High Bridge with a new cable-stayed bridge. Totaling 6.44 miles, including the bridge and connecting roadway, the project builds six-lane sections for U.S. 181 with a shared-use path for pedestrians and bicyclists. Work on the new span runs through late spring 2020, with demolition of the High Bridge completed in 2021. SH 44 parallels IH 37 into Corpus Christi from Robstown. East of Violet, SH 44 becomes a freeway, and continues with limited access standards to SH 358. SH 44 then follows SH 358 to IH 37. SH 44 is also part of the IH 69 corridor, with a long range extension proposed from Corpus Christi west to Laredo. Originally, SH 44 followed Agnes Street into Downtown – this is now signed “Business SH 44” but actually known as SS 544. The Crosstown Expressway begins at IH 37 just west of US 181, and travels south through the city to reach SH 358. The first portion of the freeway was built in 1964, with the south portion constructed by 1969. Originally ending at SH 358, the Crosstown Expressway was extended south initially to SH 357 and then south across Oso Creek to FM 44. SH 286 continues to the Chapman Ranch south of Corpus Christi. SH 358 begins at IH 37, 4.5 miles west of Downtown, and loops through the city to Corpus Christi NAS. The section from SH 286 to Ayers Street is Corpus Christi’s busiest freeway. Officially named South Padre Island Drive, it is locally known as “SPID”. SH 358 was upgraded to a freeway from the Crosstown Expressway to Airline Road in 1971, with the last gap between the Crosstown Expressway and IH 37 completed by 1992. Park Road 22 begins at SH 358 in Flour Bluff, and continues east across the John F. Kennedy Causeway to Padre Island and Padre Island National Seashore. The state highway extends Padre Island Drive from SH 358, and is a freeway until reaching Padre Island. FM 624 begins in Calallen, and runs west to the city of Orange Grove. Orange Grove, long a sleepy farming town, experienced rapid growth as a suburb of Corpus Christi due to the small town atmosphere, good schools and proximity to Corpus Christi. Page Updated January 22, 2018.